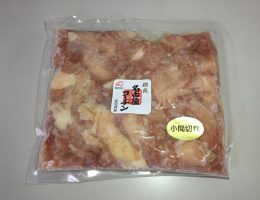 The fresh Nagoya Cochin meat is cut into small pieces of fillets by hands of craftsmen. Each piece is a perfect size for Oyako (chicken and egg) rice bowls. It is easy to use since extra handling is not needed. Defrost the meat, boil it with dashi (Japanese cooking stock), then pour in the egg and finally place on top of the rice for serving.